Has Bali lost its magic? I am really bad at keeping secrets, so before the word gets out and someone else says it for me and there is a huge misunderstanding, I suppose it is better that I actually say what I have been holding down for a while, since the day I got back from my trip to Indonesia. The truth is that I really didn’t enjoy Bali. Don’t get me wrong – I don’t think I spent nearly long enough there in order to develop a proper, informed opinion on it. I went to Bali as part of a very large press trip to Indonesia where I did not get to establish the itinerary (or else, I would have never picked to stay in Kuta Beach) let alone the food I ate, and I stayed along a little longer after the trip was over, to explore on my own. To be fair, I have seen a thing or two that were quite nice and I have actually enjoyed. And had I researched a bit more, I would have found good alternatives to the most touristy attractions in Bali. But that was definitely not enough to make me fall in love with Bali and make me want to go back. It was more like a good and welcomed distraction from all the things I did not like. It would be fair to assume that I arrived Bali having in mind the images of tropical paradise as portrayed in Eat, Pray, Love. That very popular movie (and book) has fed a lot of people with beautiful sights of empty tropical beaches, interesting traditions, and an overall peaceful place. Or so I have been told, because I haven’t watched the movie and I haven’t read the book, and so I had no Eat, Pray, Love – induced expectations to meet. In fact, I have never really had Bali in my bucket list, so I did not have in my mind the fantasy of a location I would have to look for to quench my thirst for something beautiful and take that exact same perfect photo. All I had were recollections of some friends who had been – some coming back very enthusiastic (but they are into surfing), other a bit less so. I had not even seen their pictures. If anything, what I have learned in Bali is that it is actually fairly easy to take the perfect photo even in what may be the most imperfect place (more of this later). The whole problem is that I am all about first impressions, with people and even with places. I either love something or someone at first sight, or I don’t. There is either an immediate spark, or there isn’t. There is either a special chemistry, or none at all. And if there isn’t that famous chemistry, the only thing I can hope for is a honest friendship. It is not even a matter of how beautiful a place is. It is a question of vibes. And it hasn’t happened often (although it has, to be fair) that I went somewhere for a second time and finally, magically liked it and enjoyed it. And Bali really didn’t spark in front of my eyes. It’s like I went on a date with a man and he put up his worst attire for the occasion, stick his fingers up his nose, burped loudly and talked on the phone during dinner – that is how Bali was to me. I may even try to justify the fact that I didn’t like Bali by saying that the extreme heat killed whatever little energy I had in me at the end of a very demanding and at times truly exhausting trip. I may say that the persistent stomach bug that caused me a lot of discomfort did not exactly put me in a good mood to let myself be infused with the magic of Bali. But really, that is not the case. I have still managed to enjoy Cartagena, in Colombia, or Leon, in Nicaragua, despite the suffocating heat. I have been sick all over the world (now, that is something to be quite proud of!) and it has hardly put me off a place (unless there were other reasons involved, obviously). What happened in Bali is that the first impression I got of it is that of an extremely congested, incredibly polluted, very dirty, truly commercial and way too crowded place for me to be able to enjoy it. I am not even sure it is fair to talk about “impressions” because, I’d dare to say, Bali is congested, polluted, and crowded. I really couldn’t wait to get out of Bali. So much so that the Eat, Pray, Love fantasy to me was more like a “Fast, Wish for the best and Get Out ASAP”. The impression I got in Bali is that nobody likes the idea of walking or biking. I like walking, and I tried to do that. But the minute I stepped out of the hotel, I was invested by a stream of cars and motorbikes, none of them taking notice of me, unless it was to honk loudly so that I would move out of their way. 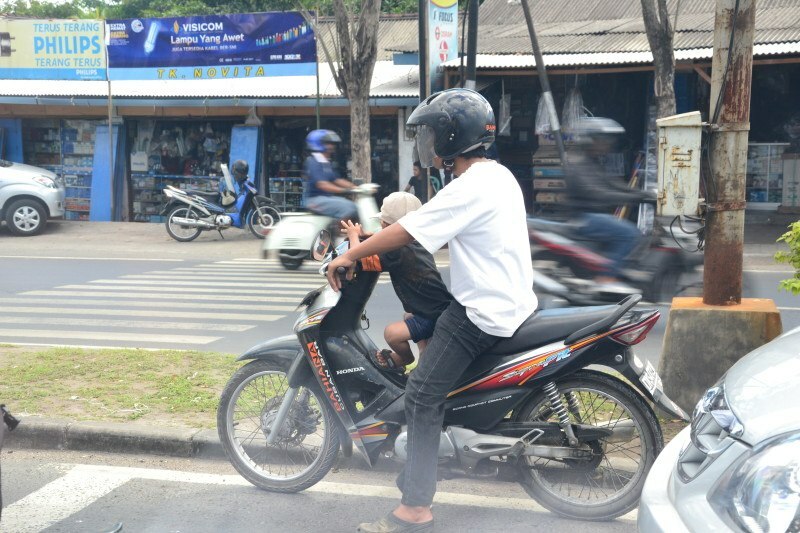 Each and every person in Bali – locals as well as tourists – moves around by car or, even better, by scooter or motorbike. All I saw were scooters and motorbikes: entire local families jump on one, keeping the Indonesian tradition alive (they take bonding really literally) and making the most of the gasoline. It was quite common to see 4 persons riding the same tiny motorbike, none of them wearing a helmet and a small child literally tied to the chest with a rope, to hold him tight while zipping through traffic. I stared at them, curiously and, at the same time, terrified of what may happen if a stray dog crossed the street all of a sudden and they had to break. Those drivers do have skills, because (as anybody who holds a motorbike license would say) keeping a balance when carrying that much weight is no easy task. I guess they were just as curious to see my stare, as they often smiled back at me as they passed (but never stopped, God forbid!). 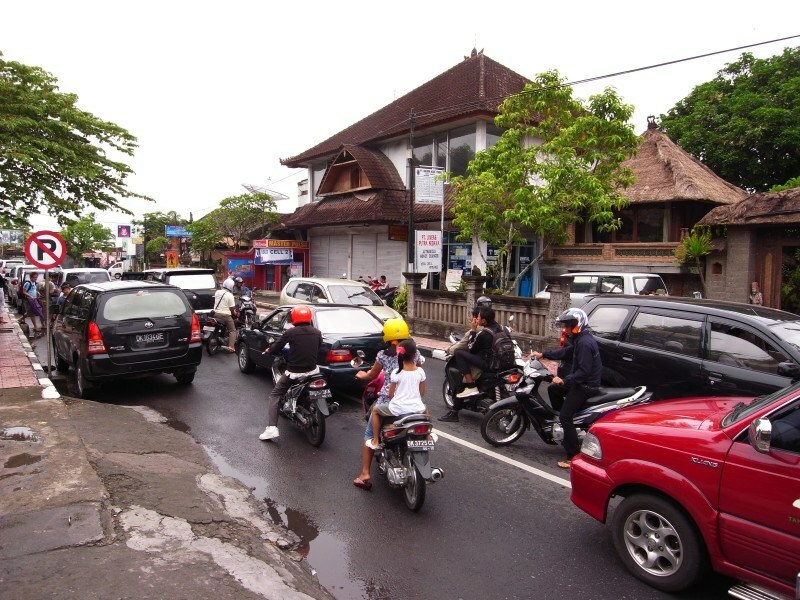 My first taste of Bali’s extreme traffic was the night I landed in Denpasar, its main city. I hopped on the bus, hopeful for a short ride to the restaurant in Jimbaran, right by the beach. I told myself it couldn’t take that long – it looked quite close on the map. I soon realized that I could have not been more mistaken. It took the bus I was on a good hour to get out of the airport terminal (a total of, perhaps, no more than 500 meters). Scooters zipped through the buses and the cars, left and right, in those narrow streets, careless of pedestrians and other vehicles coming from other directions, causing the bus driver to hit the breaks all the time (forget about being car sick!) and to press that horn at regular intervals. Too bad I did not have my iPod to listen to some music, so that loud horn noise was as close to music as it got for me. Not pleasant, especially for someone who is very sensitive to noise. As I got off the bus, I tried to cross the street. Nobody (cars, motorbikes and buses alike) would ever stop to allow me and other pedestrians to cross. Scooters would rather drive around me than stop. I was pretty certain that they would have hit me had I not run, screaming in terror, to get to safety. No distraction was allowed, unless I wanted to risk my life. I have later on tried lots of tricks to demand drivers to stop – including putting my arm out, rigidly – with little or no success. The only thing that worked when I wanted to cross the street was finding a policeman or even a hotel employee that, whistle and torch in hand, would stop the traffic so that I and other tourists could cross the street. I found it really hard to get away from traffic in Bali. If Denpasar and the nearby Kuta – which didn’t take me long to realize that is not another city, or a resort: it pretty much is just a huge neighborhood of Denpasar, and there isn’t any city interruption, let alone traffic break – are the most congested places on the island, I didn’t exactly have a joyride when I tried getting to other parts of Bali. In order to get from Kuta to the theoretically more rural Ubud I had to fiercely haggle a taxi which would have gladly ripped me off (although I had a very clear idea of the price I would have to pay). I was told it would take about 1 hour, I expected the ride to last about 90 minutes, and it eventually took 2 hours. I guess by then I was used to the different perspective on timings that Indonesians have compared to Europeans. As if the traffic was not a problem in and of itself, I was exhausted by the pollution that plagues the most crowded destinations in Bali. I spotted several locals and the occasional tourist wearing a mask to block the exhaust smoke and the bad smell coming from the piles of garbage being burnt, but I have doubts that it helped much. I was surely disappointed at this. Again, I wasn’t sure what to expect from Bali, but sure enough, coming from a city, I would never pick to go on holidays to a place that is seriously polluted and where traffic is a huge issue – it just isn’t my idea of a relaxing time. I found Ubud a bit better in terms of traffic and even more so Bedulu, a smaller city right next to it where traffic seems to slow down at least at night, and there are a few and very welcomed oasis of peace where I could enjoy some much needed silence. Bali isn’t nearly as rural and pristine as I imagined it would be. I had to check a few facts when I got there, because I could not really understand what I was seeing unless I put it in perspective. So, what I have discovered, is that it is a rather small island (a little over 5600 square km) inhabited by a whopping 4.5 million people. That isn’t a small number for such a small place. Just to give you an idea, I come from Sardinia, which is 5 times as big in size and has a quarter of the population. Not exactly crowded! 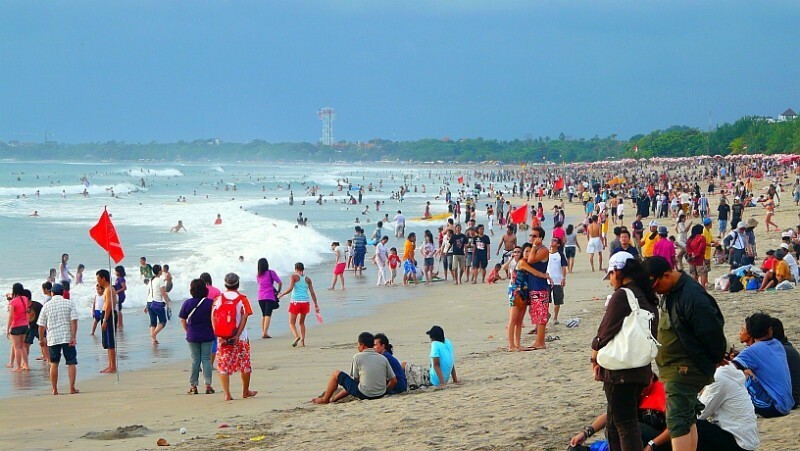 I then added to the already large population of Bali the huge intake of tourists that visit the island all year long and I got a better understanding of how crowded it was. Most of the time I just felt that there were people everywhere and it was hard for me to get away from them, and from an urban area altogether (because these people do have to live somewhere, so houses and apartment buildings have to be built). For each postcard picture of Bali that circulates on the web, showing a tropical beach, a perfect sunset and a beautiful rice field portraying a lost paradise, there should be one that shows what is going on behind the scenes, and what the rest of the landscape really looks like. Admittedly, I could not resist the temptation of making Kuta Beach look way better than it really is, to get all my friends back home a bit jealous in front of the magic I was experiencing. But that was just a perfectly concocted show, where I waited for the perfect time to take a shot. I took a few pictures at sunset and the light was lovely and looking at the waves breaking on the shore was quite an impressive show. But as I looked back, right behind me, all the magic was gone and I could once again see Kuta Beach for what it really is: not a lovely, white, sandy and secluded beach, but one where the sand is dark, there is garbage all over and right behind it there is mall after mall, shop after shop, chain restaurant after chain restaurant. And, just to make it even less appealing to me, there were the crowds. Not just the crowds there are on a Sunday in any popular Sardinian beach. I am talking about so many people that I thought I would never find a spot to sit and relax, and just stare at the ocean. I am talking about crowds that exasperate the desperate conditions in which the island verses. 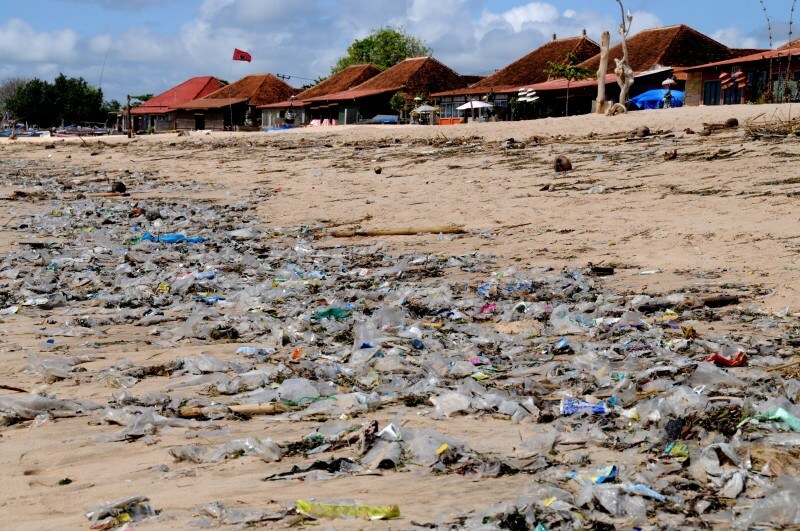 I am talking hordes of drunk tourists that find it ok to casually forget plastic bottles and bags on the beach, as if it wasn’t dirty enough already and Bali wasn’t struggling with its garbage. So much garbage there was, that when I saw rats roaming among the piles of trash I was actually not that surprised but just a bit disgusted. So many people there were on that beach, that I just wondered how they could surf without risking hitting others in the water. It was not a pretty view, at least not to me. And between all the garbage, the dark dirty sand, all those people everywhere and the vendors who tried to push flowers, trinkets and what not on me, I just thought I’d better leave and go back to the hotel and find tranquility in the privacy of my room. I am not sure where the image of a lost tropical paradise comes from, because the more I saw Kuta, the more I thought it looked like the Benidorm of Indonesia. Had I been a shopaholic I would have seen the benefit of visiting a huge mall-city. Bali surely is a shopping paradise and one could spend days browsing through the shops and the market stalls in search of a good deal, which inevitably implies the ability to haggle fiercely with the vendors in order to avoid being ripped off (the same goes for taxi rides, by the way). Too bad I can’t be bothered with shopping! I may have noticed all of this because I am a spoiled girl from Sardinia, used to beaches that despite getting crowded in the summer months, never get dirty and most definitely never get commercial (it is actually forbidden to build anything even just close to the beach, that is how much we value our territory). I do understand that being from Sardinia is at times a limit, as I can’t help compare whatever place I visit to my beloved homeland. Perhaps someone who isn’t as spoiled as I am is able to enjoy the beaches in Bali. To be fair, I found Ubud to be better than the rest of the Bali I saw. It has a bit more of a genuine feel and a bit more of character. But I can see that the impact of mass tourism and commercialization is seeping deeper and deeper here too, with more“high street” and chain shops opening to replace the smaller boutiques and the local businesses. I saw taxi drivers becoming more aggressive – they would not take a “thanks, I do not need a ride”. But at least, it was not as loud, not as “right in my face” and not as tacky as Kuta. Here’s a guide to Ubud with plenty of things to do. Is Bali really that bad? I don’t like being completely negative. And I would lie if I didn’t point out that Bali actually does have its charms and that there are a few cool things to do in Bali. 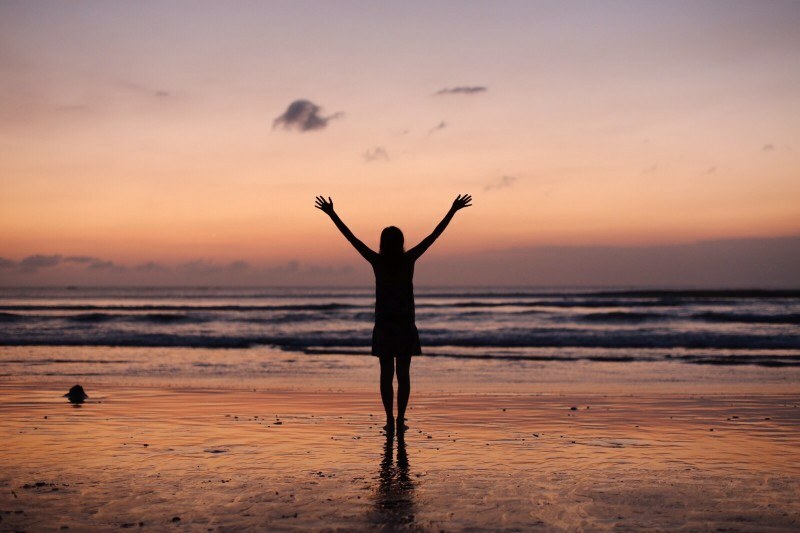 I saw some really beautiful sunsets and sunrises – so gorgeous they were, the light so beautiful, that for a while I forgot about all the other things I did not like about Bali. 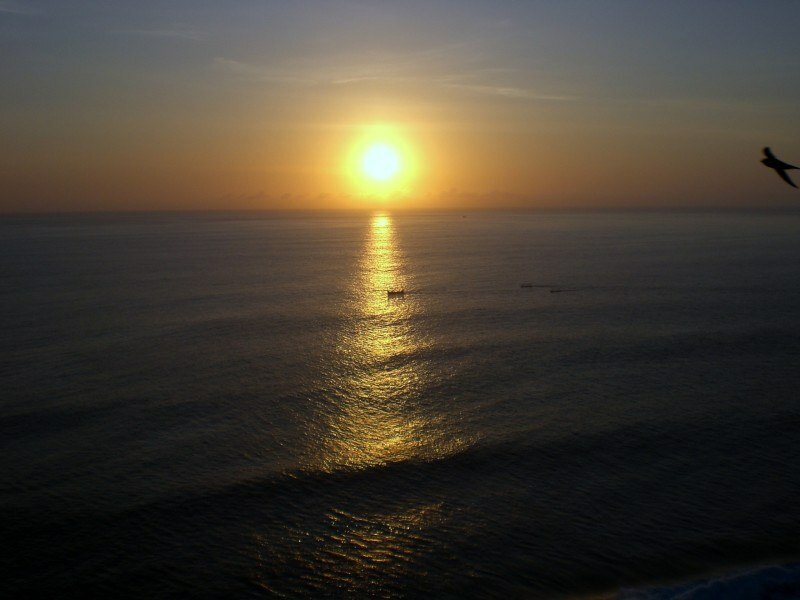 I thought that seeing the traditional boats as they navigated the ocean, at sunset, from the view point of Ulu Watu temple, was a mesmerizing view. The rice fields took me to a world that I hardly knew existed, with their bright green color. I was captured by the traditional dances such as the Kacak – yes, it is mostly a show for tourists but it was fun to watch and experience, it was engaging and I really laughed hard at the jokes. I enjoyed spots such as the Elephant Cave. 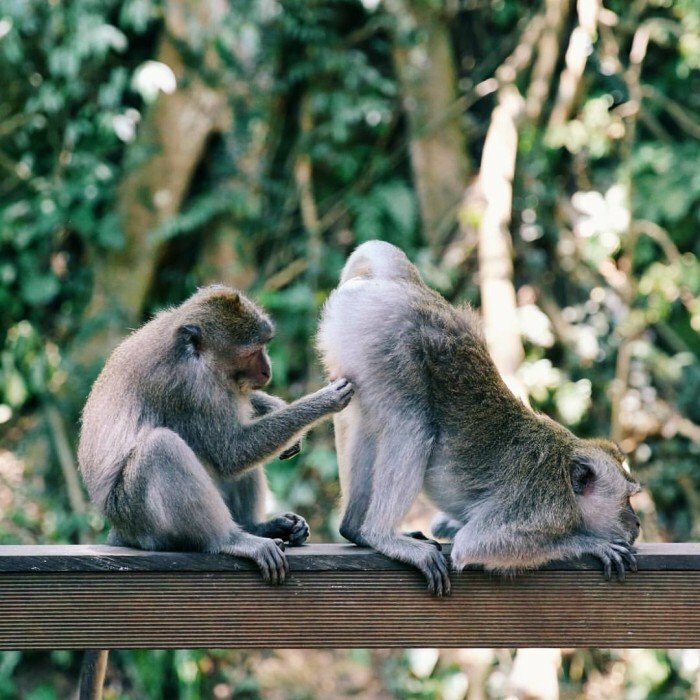 And I had a blast in Monkey Forest, where monkeys always put up a good show and I had to fight with a naughty one who thought it would be ok to steal my sunglasses (I got them back, I won!). I found a few good restaurants in Bali – from the most traditional Balinese and Indonesian cuisine, to other international cuisine, I could have a different meal every day (that is, as soon as the trip was over and I could actually make my own orders!). I saw some gorgeous resorts and hotels in Bali where I managed to relax and unwind for a real steal. And, when I looked around, asked and haggled, the prices were really convenient and it was a real budget destination where it was easy to splurge without breaking the bank. All in all, my impression is that tourism has had an overly negative impact on Bali and I am afraid that this once beautiful island has lost much of its character and its uniqueness for the sake of mass tourism. While I understand that tourism can give the local economy a huge boost (again, I shall point out I am from Sardinia and tourism is the biggest revenue here), I appreciate the need to protect the environment, the authenticity of a place, its culture and traditions. 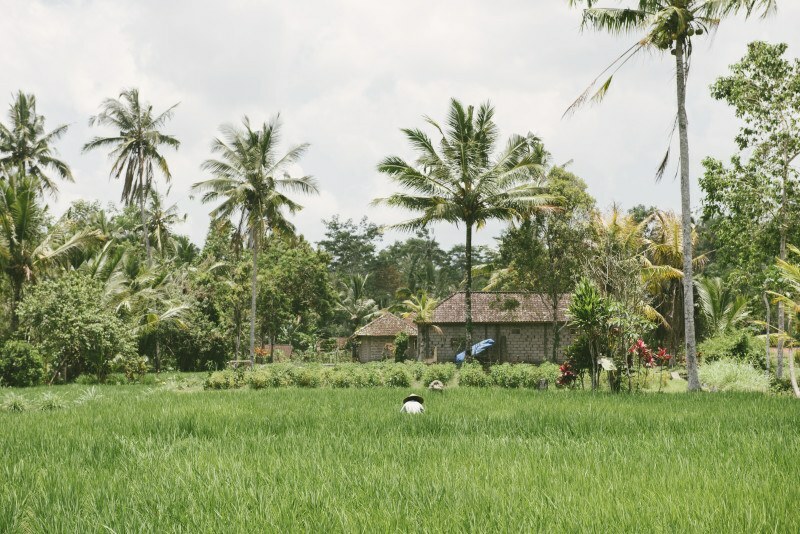 I would have liked to see a more traditional, more slower pace, more cultural Bali – where people, locals and visitors alike, can still appreciate the little things in life. I would have liked to have more interaction with the locals, one that involved more than begging them not to hit me with their scooters while I tried to cross the street. I am sure there is a better Bali – I just did not get to see it, and that is a shame because it should be everywhere and not just in the hidden spots. I really hope that the Balinese people can take the protection of their culture, traditions and environment a bit more seriously and invest in them, even as a way to attract a more responsible kind of tourism, one that has less impact on what could otherwise be a really nice place. Till the day this happens, I will prefer to stay away from it. And perhaps travel to Raja Ampat, where apparently my friend Margherita found plenty magic. Have you been to Bali? What were your impressions on it?